Easy to wear horror costume teeth. One size prosthetic teeth fit most adults and teens ages 15 and up. Full size set of upper and lower dentures. Re-useable. 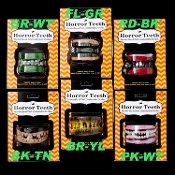 Your choice of available styles from an assortment of creepy horror character monster teeth, scary pirate choppers, spooky vampire fangs, rotten zombie dentures, ugly ghoul bicuspids, rotting corpse accessory, natural mummy prosthetic, disgusting demon fangs, or whatever unholy creature you choose to become! Made of soft, safe pvc vinyl, they are flexible, comfortable to wear and can be used over and over. Fake False Faux Gag LARP Cosplay Halloween Costume Prosthetic Accessory Decoration. -Full Set of Both Uppers and Lowers. -Carefully Cut or Trim for a Custom Fit.